The Mariposa Grove/Wawona region in the southwest corner of Yosemite National Park is famous for its sequoia grove rather than the massive granite scenery found in the rest of the park, and most of the few paths are through the giant trees. 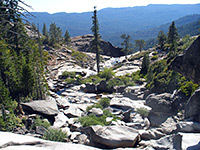 The only two longer routes are to Alder Creek and Chilnualna Falls; the latter is often used as a gateway into the wilderness of southern Yosemite, to Buena Vista Peak and beyond. Other Yosemite trails: Glacier Point Road, Tuolumne Meadows and Tioga Road, Yosemite Valley. Alder Creek 6 2,400 The Alder Creek Trail is a lightly used path that climbs northwards above Wawona through open pine & manzanita woodland, parallel to the main road, then turns away up Alder Creek, past an impressive waterfall (seasonal) then on to the far end of the Westfall Meadows Trail (see Glacier Point Hiking). Several paths branch off including one from the main road starting just south of the bridge over Alder Creek, which cuts 1.5 miles off the hike, and another eastwards through Empire Meadow to the Bridalveil Creek Trail and eventually to Chilnualna Fall. 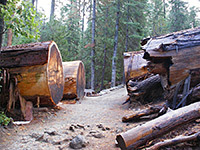 The starting point for the Alder Creek Trail is 0.4 miles up the side road to North Wawona. The first part of the route has distant views over wooded hills while the second half is more enclosed. Chilnualna Falls 4.1 2,000 At 240 feet, Chilnualna Falls is the highest Yosemite waterfall outside the main valley, and one of the least visited since it lies at the end of a moderately strenuous trail and is not close to any other main attraction in the park. The path begins at the end of the 2 mile paved side road through Wawona by following the creek upstream, through shady woodland of mixed oak/pine/manzanita, then moves away from the stream up a more open, granite hillside, and finally turns back south to the head of the falls. 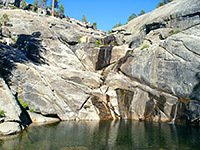 This is an area of much exposed granite, with the rocks adjoining the creek polished smooth by spring floodwaters. Just upstream of the falls, after a few more switchbacks, is a junction; left is the Bridalveil Creek Trail from the Glacier Point Road, right is a path to Grouse Lake, Chilnualna Lakes and Buena Vista Peak. Outer Loop (Mariposa Grove) 7 (loop) 1,000 Starting and finishing at the parking area at the end of the publicly-drivable section of the Mariposa Grove Road, the Outer Loop Trail winds across quite steep, forested slopes passing some sequoias though mostly ponderosa pines. Various shorter paths branch off to points on the road, where most of the large named trees are found; in the Lower Grove, just above the carpark, are the Fallen Monarch, Grizzly Giant and California Tunnel Tree. The Upper Grove has the Columbia Tree, the fallen Wawona Tunnel Tree and the Telescope Tree, amongst others. A worthwhile hike in the Mariposa Grove can range from 30 minutes to several hours. Wawona Meadow Loop 3.5 (loop) 200 This hike follows an old vehicle track around a long, thin, grassy meadow either side of a tributary of the South Fork of the Merced River. 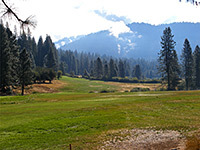 The north end of the meadow has been made into a golf course for the Wawona Hotel but the remainder is largely unspoilt, although the main road runs just to the east, and the path is shared with horses. Parking for the hike is outside the hotel, or in front of the general store just down the road. Mariposa Grove 6 2,400 Running between the village of Wawona and the spur road to the Mariposa sequoia grove, this path provides a not-too-exciting alternative to the highway; all the route is through quite thick pine woods with a steep climb at the southern end, as the sequoias start to appear. Occasional views to the north are good, but Wawona Point has a better outlook and is more easily reached. One way trips are possible using the free NPS shuttle bus. Wawona Point 0.5 200 The highest point in Mariposa Grove is a wooded summit so the view is not a full 360° panorama, but still takes in an impressive amount of forested hills and valleys. The short path to the top begins at the far end of the old road, served by the tram; the hike from the car park is just over 3 miles, one-way.